Anti-corruption intrigue and opposition fanfare are leaving Ukrainians and the west disillusioned with Poroshenko’s politics. 5 December: former Georgian president and Odesa regional govenror Mikheil Saakashvili is detained in downtown Kyiv. (c) Serg Glovny/Zuma Press/PA Images. All rights reserved.An embattled and tired former Georgian president Mikheil Saakashvili emerged briefly in the protest campsite he helped to create outside Ukraine’s parliament last night. Losing his voice, Saakashvili spoke quietly to again deny the charges by the authorities that he accepted money from Ukraine’s previous pro-Russian regime. Saakashvili is experiencing first-hand the rollercoaster ride of Ukrainian politics. The ex-statesman has been reduced to sleeping on the floor of a tent to avoid detention, just metres away from the Ukrainian presidential administration he once frequented. When Saakashvili became the governor of the Odesa region almost three years ago, at the invitation of his university classmate Petro Poroshenko, it was a different time. The tacit support that existed for President Poroshenko and his team is now crumbling, with Saakashvili being just one of many who criticises their dedication to reform. With the events of the last week, Ukraine’s western partners have become the latest to openly criticise the president. 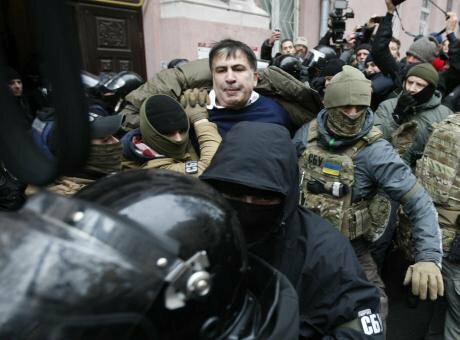 Ukraine’s security services botched an effort to detain Saakashvili on 5 December when they raided his apartment accusing him of planning a coup. In what turned into a worldwide spectacle, Saakashvili climbed up onto the roof to allow time for his supporters to gather below, he has said. He was dragged from the rooftop and into a van, but his supporters successfully blocked its exit and after several hours of pushing and shoving, freed Saakashvili. With his emboldened supporters, who numbered roughly 1,000, Saakashvili marched to the protest camp where he has remained. Ukraine’s Prosecutor General Yuriy Lutsenko, who released a disputed recording as evidence of Saakashvili being a Russian agent, said he had 24 hours to hand himself in. But the deadline came and went, the authorities seemingly unwilling to risk further violent confrontation as supporters placed piles bricks around the perimeter of the campsite. The answers to these questions remains to be seen. Saakashvili has always been a fierce Putin opponent, but he has refused to name his sponsors, saying they will be targeted by Ukraine's security services. The authorities’ manhandling of Saakashvili failed to win him any significant increase in supporters and his calls to oust Poroshenko continue to fall on deaf ears. Ukrainians are completely disillusioned with all politicians after the 2014 Maidan, after which their standards of living dropped dramatically, according to political technologist, Volodymyr Fesenko. 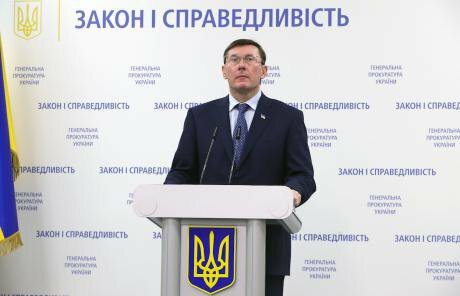 Prosecutor general of Ukraine Yury Lutsenko briefs the press about the detention of Mikheil Saakashvili on 5 December. Photo (c): Pavlo Bagmut/Zuma Press/PA Images. All rights reserved. This delusion can be seen by an anticipated turnout of 40-45% at the next elections, according to Anton Grushetsky of Kyiv's International Institute of Sociology. The turnout for the 2014 presidential elections was 60%. Prosecutor General Lutsenko has been accused of trying to exert control over the National Anti-Corruption Bureau. Lutsenko, who was appointed by Poroshenko, ordered the arrest of several NABU investigators for alleged bribery and in the process exposed what were undercover operatives. Ukraine’s western partners have described Lutsenko’s actions as interference and undermining public trust. Simultaneously, a group of lawmakers tried to introduce legislation which would have given parliament the power to fire the head of NABU, the Special Anti-Corruption Prosecutor (SAP) and members of the parliamentary anti-corruption committee. Activists campaigned for over a week on Facebook for the law to be taken off the agenda. Transparency International Ukraine issued an urgent statement on 6 December calling on the international community to react to attempts to threaten the bodies’ independence. Civil society activists worked through the night on 7 December with Ukraine’s western partners to pressure the authorities into removing the bill. Though they were successful, the tone of Ukraine’s western partners has decisively changed. Dozens of current and former western officials took to Twitter to voice their disapproval with the hashtag #SaveNABU. The US State Department issued a statement that stated Lutsenko’s investigation into NABU is eroding international support for Ukraine. A senior director at the PennBiden think tank, Michael Carpenter, described the law a “disgrace” on Twitter and said he would recommend the cutting of all US funding, including security assistance, if it was voted on. The European Commission had already decided not to transfer the next installment in their 1.8m euro loan this month because of Ukraine's failure to implement the last four conditions for the loan, including launching an automatic system for checking electronic asset declarations, and a system for checking the beneficial owners of companies. IMF funding is “paused” and its head Christine Lagarde criticised the attacks on the anti-corruption bodies in the past week. 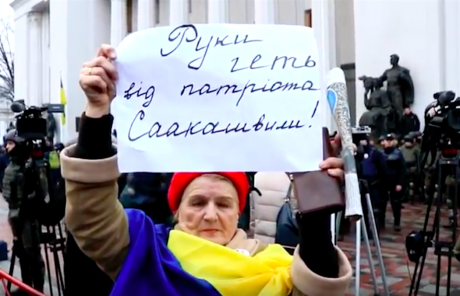 “Hands off the patriot Saakashvili!” reads this banner at the protest camp outside the Rada building in Kyiv. Image still: YouTube / Sergey Youtubich. Some rights reserved. NABU said in a statement it see these events as part of a bigger plan which was launched last week: “The main objective is the destruction of NABU and SAP.” Artem Sytnyk, the head of NABU, said yesterday that he doesn't expect to be in the position much longer. But the firing of Yehor Sobolev, head of the parliamentary anti-corruption committee, is in fact more imminent. The committee he heads decided to register a parliamentary vote for his dismissal on because it refused Sobolev’s choices of candidates for auditing NABU. The all-night campaign appears to have prompted Poroshenko into announcing he will push for anti-corruption courts to be introduced before the end of the year — something that was not previously on the agenda. This shows that the west still carries weight in Ukraine, according to Rebecca Harms, a member of the European Parliament, and a member of Friends of Ukraine in Brussels. “We haven't yet achieved a solution but this shows that our reactions have consequences,” Harms said by phone, after talking to Ukraine’s ambassador and representatives in Brussels last night. Poroshenko has said if he does not see progress at the end of next week he will write the draft law himself. “I think things are moving,” said Harms, though they will wait to see how Ukraine’s parliament reacts. Saakashvili whose achievements in clearing up corruption in Georgia are widely recognised, has failed to recognise the mood of Ukrainians, however. Ukrainians are put off by Saakashvili’s loud political protests and fear another revolution, Volodymr Fesenko told me: “Their fears play against Saakashvili.” But in allowing for the possibility of violence, (the piles of bricks, dozens of bags of rubble unloaded from neighbouring cars and the masked men), it has shown that he is operating a campaign typical of his generation of post-Soviet politicians. One that is focused more on personalism than institution building. Update: Yehor Sobolev, head of the parliamentary anti-corruption committee, has now been voted out of his post.